BioWare’s just posted the second part of Dragon Age: Inquisition’s E3 demo. Part one showed off dragon-slaying and a spot of exploration, but the second part focuses on the Inquisitor’s companions and they make their way through Redcliffe Castle. 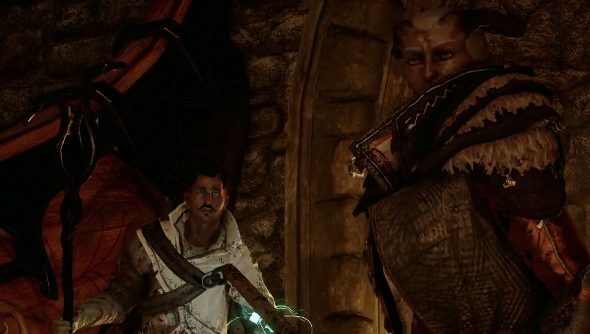 We get to see an angrier, more savage version of Leliana, obviously hardened since Origins, and we’re introduced to the moustachioed mage, Dorian, who David Gaider says is the first gay character he’s written. The animation looks a tad stiff, doesn’t it? But other than that it all looks like good stuff. The treat in this video is the peek we get at the tactical combat. It descends into action pretty quickly, lamentably, but it certainly implies some tactical depth. When Dragon Age: Inquisition launches on October 7th, we’ll get to see for ourselves if we can forgo action-based combat and enjoy more tactical, thoughtful battles.